Organisations in Skegness are being urged to support a summer project that gives young people the chance to achieve something amazing by pledging a venue. The plea has come from Lincoln-based social enterprise, The EBP, ahead of this year’s National Citizen Service (NCS) programme. NCS is a scheme for 15-17 year olds which takes place outside of term time in the spring, summer and autumn holidays. It is the fastest growing youth movement for a generation, with over 275,000 graduates across the country so far. Last summer, Skegness residents benefited from 900 hours of volunteer work through NCS. Thirty young people worked together in Skegness to create their own social action project using skills they developed on the programme, designing a mural for the main wall in the youth centre, as well as making over the garden and fundraising for plants and other materials. The group also utilised the youth centre as a base to plan fundraising events to raise money for a new roof for the Village Church Farm. 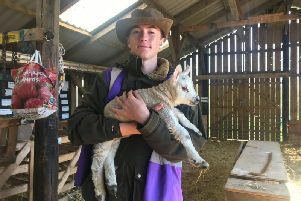 Trevor Monahan, manager at the Village Church Farm, said: “NCS have enabled the Village to restore the ceiling in our listed farmhouse to its former glory. Cheryl Barrows, Community Engagement Officer for The EBP, said: “Local businesses can play a vital role in helping our young people to make a difference in their community, simply by offering a space. The EBP has delivered NCS in Lincolnshire, Leicestershire, Northamptonshire and Rutland, an area referred to as EM1, since 2013. In this time more than 13,000 young people have graduated from NCS in the EM1 region, each contributing over 30 hours of voluntary work to their communities.